I have been contemplating beginning to start setting aside nickles, dimes and quarters for a 1872 cartridge purposed revolver. I have reservations on the possible differences between the 1851 revolver which I could permanently change into the revolver that I am sure has the correct FEEL and dimensions versus the unknown [ to me] feel and measurements of a 1872 revolver. I want a revolver to be chambered in 38 special with the barrel to be punched for the .357 calibre as well. It must have the dimensions of the 51 navy/61 navy with a slightly shorter barrel length ... say 5 inch or so ... about even with the ejector housing. I want the navy grip with the round trigger guard loop. So question is ... will the 72 have these quality's or will I need to build it meself ? I have modified a 60 army to 45 colt and a 3 inch barrel but I desire a 36 dimensioned short gun that has the afore mentioned .357 cal barrel so I am not stuck with hollow based wadcutters for accuracy nor needing to use heeled bullets for accuracy. Can I possibly get opinions and comparisons on these 72 revolvers compared to what I desire in my next possible purchase? The originals only came with a 7 1/2 inch barrel but Uberti makes them in 4 3/4, 5 1/2 and 7 1/2. To get the barrel even with the ejector rod housing you want a 4 3/4. I'd go with the 72. You get the correct bore diameter, a barrel mounted rear sight and no ram hole. I thank yee. My main concern is in dimensions. I do know about the best buy thing but ... if the frame or cylinder or even the barrel outer diameter is different than chances are the revolver will not handle like what I desire. In my estimation, if the dimensions are larger such as the 73 is ... then cost be danged ... I will convert a 51/61 revolver and sleeve the barrel to arrive at what I want. Do any have one of each to report a comparison for me? My goal is to achieve the 51 feel in the revolver and still be chambered and bored for 38 special. I would love to order the Uberti 72 in 4.75 inch barrel, but if it don't FEEL right ... then I will still have to build what I want ... and beings cash don't grow on any Oregonian tree I know of ... I would rather save once for what I am hoping to achieve. I have owned and shot a second gen Colt 73 in 357 mag with the 5.5 inch barrel. Heavy bugger and handled like crap. Sold it at a loss cause it jest dint fit nor feel right to me. If the 72 model is as heavy and awkward as that crud pile, then that is what I am inquiring about. I guess another way of asking is thus ... is the 72 Uberti in 38 special just a 45 colt gun punched to the smaller 38 cal through the same size metal as houses the 45 model ... or is the 38 navy smaller then the 45 army like the 51 ... 60 difference? The frames on the 51/60 guns are the same. The only difference is the rebate cut into the Army frame to accommodate the larger cylinder. It has the Navy backstrap and trigger guard. Thankyou. That is the very info I sought. Also found on the Dixie description of the 71/72 of barrel diameter and revolver weight. All this leads me to think that the 38 cimmeron or taylors 38 models 71/72 Colts are indeed what I am lookin for. Now next Question ... what if any is the difference between the Cimmaron revolvers and the Taylors revolvers. Both built by Uberti. The Taylor's is some bit more expensive is why I ask. Also these open top 72 Uberti's ... do they need the typical arbor length fix like the percussion models? There used to be a Rumor going around that Taylors and Cimarron were cherry picked but that's pretty much been disproved. Yes the arbor will still need to be fixed. 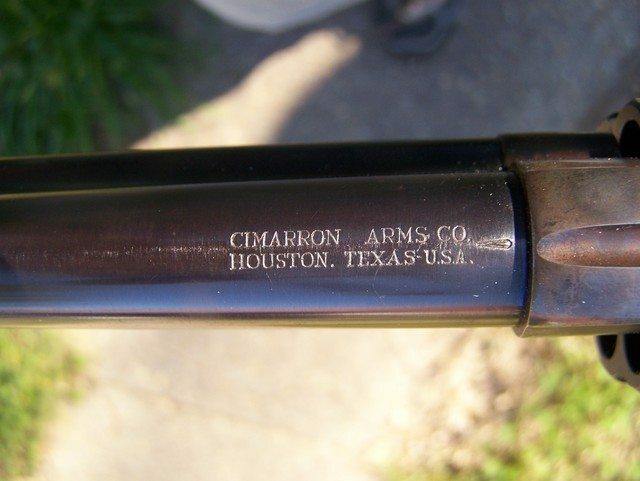 I do like the barrel address on my 73 Cimarron better than the run of the mill Cattleman. Cimarron vs Taylor? 6 of one half-dozen of the other. Get the pistol from who ever has the cheapest price. Check with Buffalo Arms too, they are about $80.00 cheaper than Cimarron or Taylors.